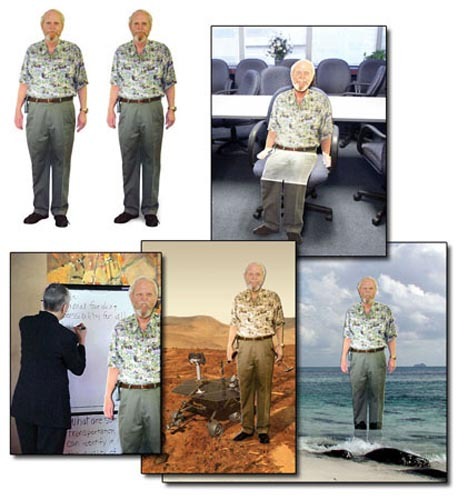 DESCRIPTION: We needed the PAG director at a few meetings he couldn't attend, so he gave me permission to make a "Flat Tom." -- After taking several images and putting them together (so I would have a high-resolution image to enlarge to full size), I took a little weight from the image, printed it out life-sized, glued it onto foamboard that was made with the proper tape hinges for bending, trimmed, and eight different heads were added with a different expression on each. The faces were added so they could be flipped to the back when not in use. -- Flat Tom was then sent to a meeting, Mars and the ocean. Here's Flat Tom with a group in the People Photos area.